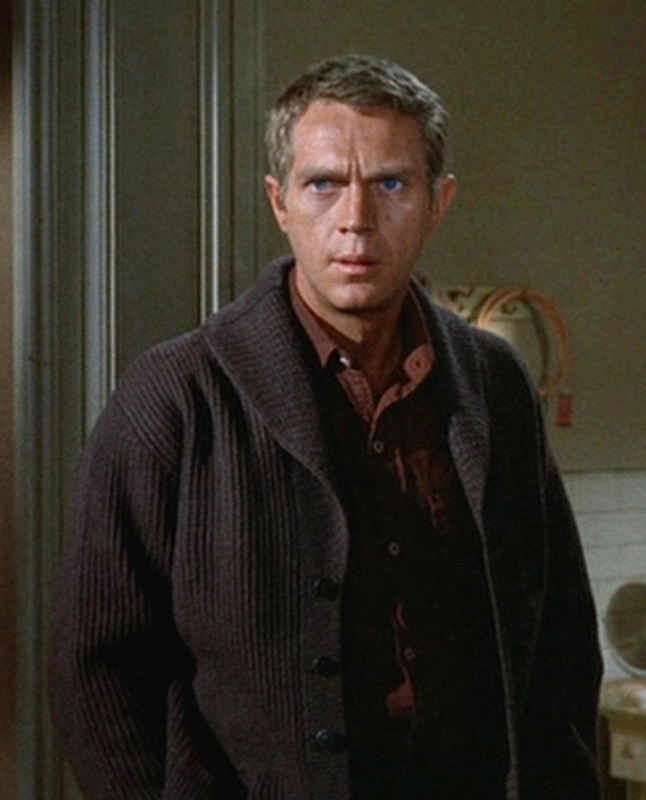 Both on and off screen, the shawl collar cardigan was a McQueen favorite. He notably wore a navy shawl cardigan during William Claxton’s famous photo sessions of McQueen and his first wife, Neile, in California in 1964. Steve and Neile, photographed by William Claxton. California, 1964. 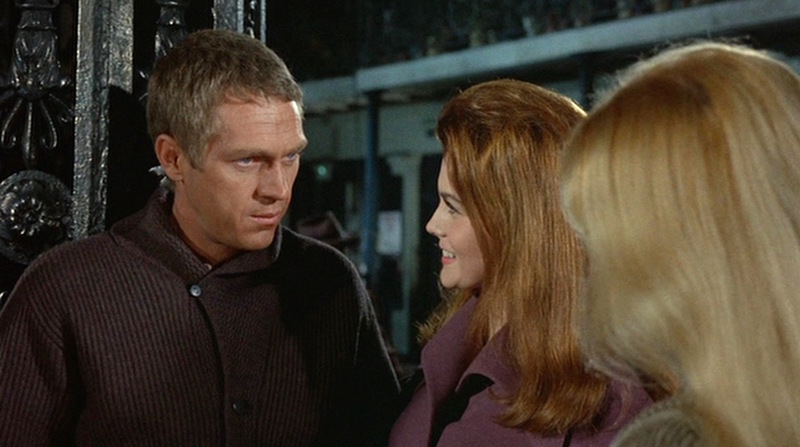 In The Cincinnati Kid, filmed and released around the time of Claxton’s Carmel and Big Sur sessions, McQueen’s Eric “the Kid” Stoner sports a brown cardigan that works just as well 80 years after the film was set for gents seeking casual weekend attire… or attention from Ann-Margret or Tuesday Weld-types. Steve McQueen’s timeless sartorial sensibilities made it easy for him to incorporate many of his favorite items in real life – a waxed motorcycle jacket and a tweed sport coat, to name two – into the wardrobe of his titular character in the 1930s-set The Cincinnati Kid. As I noted above and in an article for Primer magazine earlier this year, the shawl collar cardigan is a classic McQueen essential item. 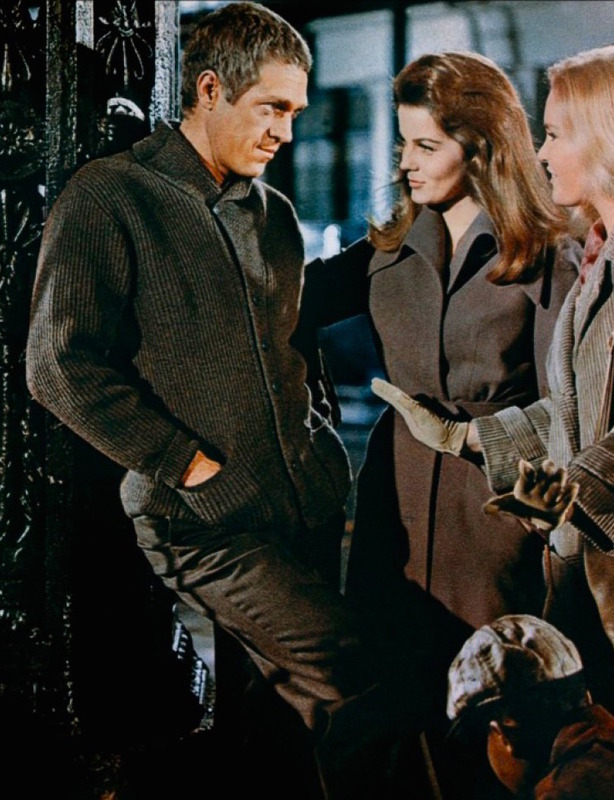 The Kid’s brown ribbed wool knit cardigan makes its first appearance during an evening shoe shine when he is met on the street by his girlfriend Christian Rudd (Tuesday Weld) and her reckless friend Melba (Ann-Margret), the sultry wife of a rival poker player. The sweater has six black sew-through double-hole buttons down the front with a smaller seventh button fastening at the neck to protect against the nighttime chill. The Kid chats up Melba and Christian. Once he’s inside, The Kid wears the sweater open to reveal the wide shawl collar and his rust brown shirt. 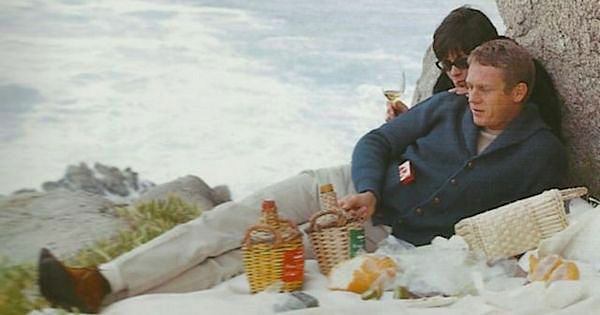 The sweater has the same features as his navy cardigan in the Carmel sessions, including patch pockets on the hips and elasticized cuffs that he rolls once over his wrists. To find similar cardigans for a range of prices, check out this comprehensive feature from Iconic Alternatives. 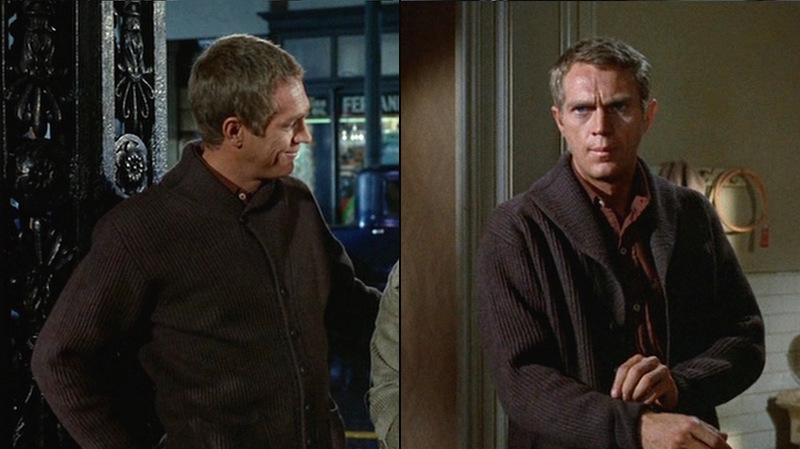 McQueen’s sweater fully buttoned outside and totally open indoors. The Kid wears his cardigan over a button-up utility shirt in rust brown flannel, with the shirt’s warmer orange-like shade nicely contrasting against the cooler chocolate brown of his sweater. 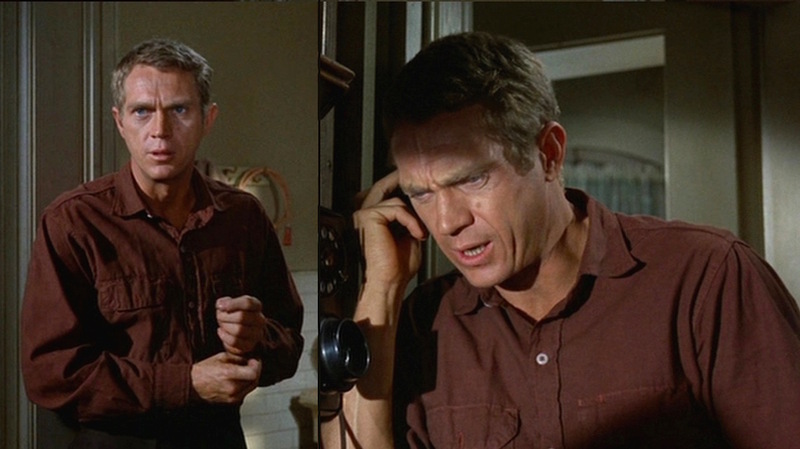 The shirt is similarly colored to the rust orange wool sweater that he wears with his black waxed jacket and his olive corduroy sportcoat in other scenes. The shirt has a spread collar, button cuffs, and a front placket with the top button undone at the neck. The two patch pockets on the chest have mitred-corner flaps that McQueen wears unbuttoned, allowing the flaps to do just that. The Kid’s brown wool trousers are a bit too matchy with the cardigan, but they fit the character and the context. They share styling with the gray wool trousers he wears elsewhere with single forward pleats, a hook-and-eye extended tab waistband front closure, small belt loops, slanted side pockets, and cuffs (turn-ups) on the bottoms. 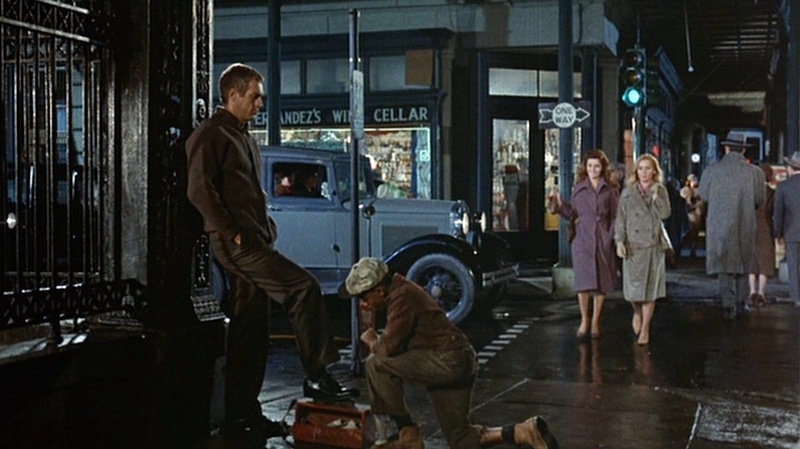 The Kid settles back for an evening shoeshine as Melba and Christian approach. The Kid’s black patent leather derby shoes have never looked better, as we catch him in mid-shine at the beginning of the scene. He wears them with black socks. Steve McQueen’s penchant for timeless style allows for a character’s outfit in 1936 to translate just as well to your early fall weekend casualwear in 2017. You can’t go wrong with a shawl collar cardigan! Looking for a versatile approach to the same aesthetic? Try it with other McQueen-approved staples like khaki chinos and a pair of desert boots. Nice style, but jeez, they didn’t try very hard with the historical accuracy. Look at the women’s hair! Pure 60s. Agreed! I like the style of the film, but it’s certainly more mid-1960s than 1930s.